(CP): President Obama has been fiercely criticized by former Vice President Al Gore for his lack of progress on climate change in a magazine article set to be published Friday. gore criticized Obama saying that he had failed to act decisively to make any significant changes to the country’s climate change and energy policies. The rebuke came as Gore wrote for “Rolling Stone” magazine, where he said: “President Obama has never presented to the American people the magnitude of the climate crisis. He has simply not made the case for action. 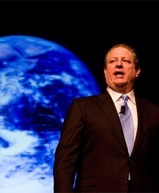 “He has not defended the science against the ongoing, withering and dishonest attacks,” Gore said. Gore explained that Obama has failed to stand up for “bold action” on global warming and has made inadequate progress on the problem since the days of Republican President George W. Bush.